Today on That Business Show, I welcomed Robin Lavitch, President and Founder of Surpass Your Goal, a coaching/training company that she has run successfully for the past 9 years. She works with entrepreneurs of all professions from Realtors to Financial Planners but focuses on coaching Attorneys. Robin has a background in education and holds a Master’s Degree in Psychology which she puts to good use in this industry. We spoke of her path to entrepreneurship and how she helps others both personally and professionally grow their businesses. Many times the business finds us as it did with her and did with me. Her strategic and humorous approach has inspired others to leverage their strengths and emerge victoriously in communication, marketing, business planning and time management. Reach out to Robin for a consultation at 727-776-7766 or email at robin@surpassyourgoal.com and visit her website at http://www.surpassyourgoal.com for more information. On the 2nd half of the show, I welcomed Expert Contributor Jim Yeager of Yeager and Company. He was joined in studio with his plumber and fellow entrepreneur Charlie Paleveda aka Charlie the Plumber. Charlie is a well known chronic radio caller and a highly entertaining character. He tells a hilarious and highly entertaining story on this show about his days as a professional wrestler that nearly got him killed. 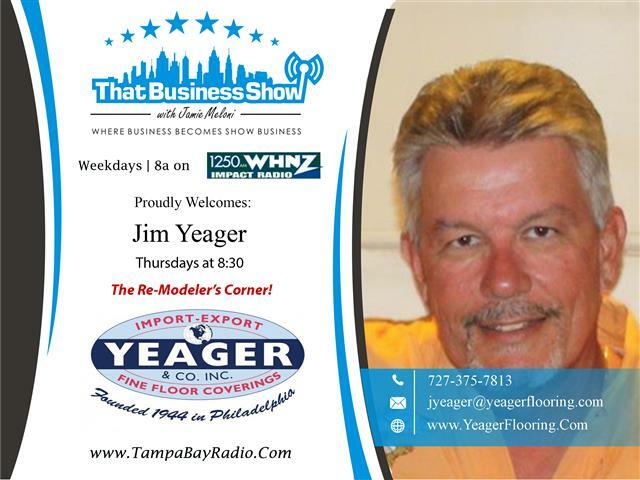 Tune into this great show to hear the story and as always reach out to Jim Yeager of Yeager and Company for all your contractor needs from flooring to remodeling. Learn more at http://www.yeagerflooring.com or contact them directly at 727-375-7813 or email at jyeager@yeagerflooring.com!